CASE INFORMATION This was SJGR's tenth visit to the historic Burlington County Prison. To see the results of our previous investigation, click here. SJGR was asked to accompany staff members and guests of the Prison Museum on an exclusive investigation for educational purposes. The physical evidence collected consisted of 2 EVPs and 13 positive photos, including 2 Night Vision apparition photos taken by SJGR director Dave Juliano. Click here for a dedicated page on these photos and the system used to capture them. Since the 3% percent of positive energy orb photos obtained falls slightly below average, it cannot be factored into the overall evidence. No anomalous EMF or temperature readings were recorded. However, the two apparition photos combined with three motion sensor readings recorded during this investigation are highly significant and compelling evidence. South Jersey Ghost Research was the group that the county freeholders called in to assist with problems they had been having during the refurbishing of the building in 1999. The men working in the building were experiencing many unexplained phenomena and it was starting to slow down progress. 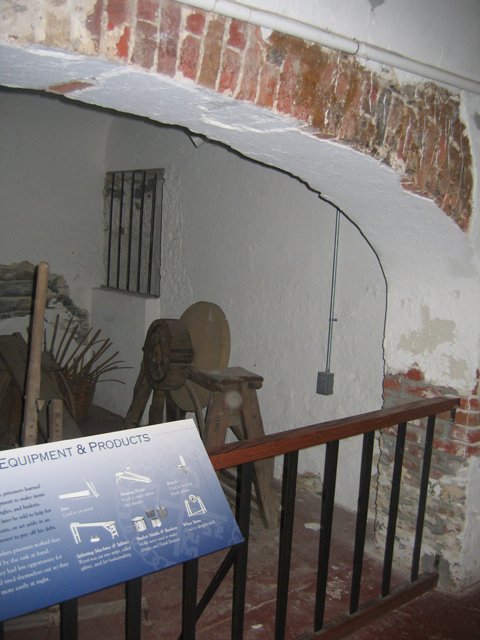 Designed by Robert Mills, architect of the Washington Monument, it was once to oldest prison in continuous use in the United States and is now a National Landmark. When the last prisoners left in 1966 it had been open for 155 years. The Burlington County Prison Museum is open for tours. There have been a lot of unexplained activities reported over the years including voices, objects moving or levitating, apparitions and much more. You can find out more details on the history of the haunting here. 7:59pm - Investigator Griffiths took this photo in the basement after experiencing the sensation of being followed and during an EVP attempt with Investigator Haines.